It seems like five minutes ago we entered 2016, yet here we are within what feels like a blink of an eye getting ready to see off yet another year and sing our hearts out to Auld Lan Syne. However, we need not fear, for the end of one year signifies the start of a new one; a time for new beginnings and a fresh start. The general consensus is that 2016 was a very significant year, not just in worldwide politics, but for influencer marketing too as more people ‘get it’, setting us all up for what should be a very exciting 2017. Throughout 2016, out of 86% of marketers having used the tactic, 94% found it effective. Last year, we did a post on our predictions for 2016, so to start this off we thought to get all nostalgic and assess the progress and legitimacy of those predictions, before predicting the future yet again. WHAT DID WE PREDICT FOR 2016? As brands understand influencer marketing more, they also understand that their employees can take a similar approach in terms of their own influence. What better influencers than those that have an internal connection to a brand? Employee advocates can also build a much warmer bridge between your brand and external influencers. After all, 77% of buyers are more likely to buy from a company whose CEO uses social media. Brands have definitely focused more of their attention on this, but it is still quite early days. We predict that this will continue to increase in popularity next year – you got an extra prediction for free, Merry Christmas! 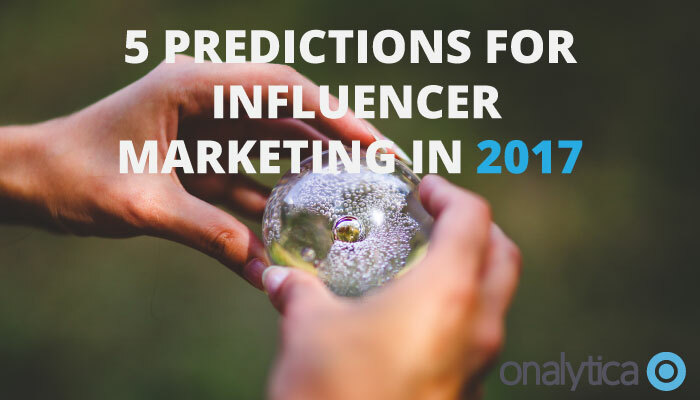 This was essentially predicting that in 2016 influencer marketing would begin to be recognised and appreciated in its truest form- working with and building relationships with the smaller, tier 2 influencers in an organic way. As mentioned before, more people have gotten their head around this concept, which would suggest that we were very much correct with this prediction. The term has also evolved from Tier 2 influencers into ‘micro influencers’, suggesting this is a much more accepted concept. However, there’s still room for progress. Similarly to the above point, brands have begun to realise that not only are you likely to have more success working with ‘smaller’ tier 2 influencers, but you’re also going to have more luck if they’re extremely relevant and authentic. Again, more and more brands are recognising this, but there is still room for improvement. While the market is very much still in the growth stage of the cycle, a well established market place for software solutions is emerging. However, while there are some that are slightly ahead of the game, there currently isn’t a solution leading the pack- so there is still a lot more maturing to do. Influencer marketing has up until recently been very Twitter focused in terms of social media listening and measuring influence. This is mainly due to API restrictions as opposed to marketers being closed minded. The industry as a whole has made good progress in terms of gaining access to other important social channels. However, this hasn’t yet resulted in industry wide analysis across various social channels. As mentioned, influencer marketing is increasingly becoming about the ‘micro influencer’, as they’re easier to engage with and therefore often yield more results. We believe that this trend will stay put well into 2017 as brands continue to shift their focus from trying to engage high profile macro influencers, to almost entirely targeting smaller more niche influencers. With this, influencers with a high following may be regarded more as a celebrity. This is something we predicted for 2016 and while progress has been made, as an industry, we’re still not quite there. Industry wide the focus on social media engagement as a means of identifying influencers has very much been across Twitter- both due to this being the most popular social channel to engage on and due to API restrictions. However there is a need in the market, albeit smaller, to conduct analysis across other channels such as Instagram and LinkedIn. We predict that in 2017, the industry will continue to make progress in this area, or in fact make this is a reality. As it stands, influencer relations focusses more on organic engagement. However, as influencer marketing increases in popularity, more brands exploring influencer marketing may look to do so by working with paid influencers, as organic engagement doesn’t necessarily work for every brand. Therefore, we predict there will be a stronger differentiation between paid influencer marketing vs organic influencer relations. 4. AUTOMATION TOOLS: SINK OR SWIM? Social media automation has continued to increase in popularity amongst the market throughout 2016. However, there is a question of the legitimacy of someone’s social media following if they’re using Twitter automation tools to either like, re-tweet, post or follow others on Twitter. We predict that automation tools will either continue to increase in popularity, or will begin to lack legitimacy in terms of determining influence. As the general message across influencer marketing is organic engagement, we believe this message will extend to the way in which someone builds their influence and following too. 5. WHAT DO YOU MEAN YOU’VE NEVER HEARD OF INFLUENCER MARKETING? We believe 2017 is the year where brands finally start to feel as though if they’re not doing influencer marketing, they ought to be. The question of “what is influencer marketing?” will soon diminish and be replaced by “why aren’t you doing influencer marketing?”. As another year passes Millennials will have more power over the market place; as consumers they will have more disposable income and as professionals they will have more say in the buying and decision process. Therefore, the way in which brands look at influencer marketing should change, as they see it more as a ‘when’ they implement influencer marketing as opposed to ‘if’. With this we expect brands who have explored the influencer marketing space to pump more time, money and emphasis into it. In 2016, the majority of marketers spent between $25,000 – $50,000 per influencer marketing program. A survey carried out here reported that this figure will double to $50,000 – $100,000 per program in 2017- 48% of respondents said they’re going to increase their spend. If our blog post has inspired you to get the ball rolling with influencer marketing ahead of 2017, then why not trial our influencer discovery tool here.